Pastoral Care from the Pulpit connects the head, heart, and soul issues of everyday life, presenting a pastoral care approach to preaching and teaching practical Christianity. This powerful, progressive book gives hope to anyone struggling to survive and thrive as a spiritual person in difficult times. The author, a practicing psychotherapist who is also an ordained minister, explores Biblical stories and passages to find practical motivations for living as a Christian, offering encouragement to those suffering from a lack of purpose, identity, or acceptance. 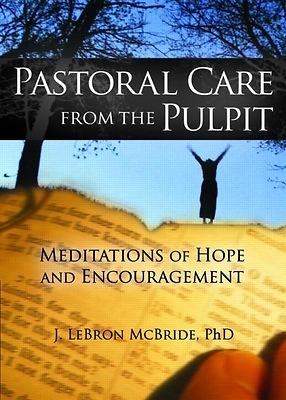 Pastoral Care from the Pulpit makes creative use of counseling and pastoral care principles to serve as a handbook for spiritual survival against life's everyday challenges. The book is an outgrowth of sermons delivered by the author at First Christian Church in Rome, Georgia, creative explorations of the Bible that blend theology with preaching to remain relevant to real life. It can be read a chapter at a time for daily affirmation, or taught one chapter a week as a class study; questions are provided at the end of each chapter to encourage reflection. Pastoral Care from the Pulpit is an invaluable aid for ministers, chaplains, and pastoral counselors working with mainstream Christian denominations.